Born in Rialto, Dublin in 1961, Kevin Moran excelled in two games, gaelic football and soccer. When the family moved to Walkinstown, Keven attended James Street CBS and Drimnagh Castle CBS, where gaelic football was the dominant sport. During these years he was equally interested in soccer and, while he played gaelic football with Good Counsel, he played soccer with Rangers, Bohemians and Pegasus. His football ability was recognised by the Dublin county selectors and he was drafted into the under-21 side. He progressed from there to the senior side, making his debut in 1976. He won two All-Ireland Championship medals with Dublin in 1976 and 1977. He helped Dublin to defeat Kerry — who had beaten Dublin in the 1975 final – in the 1976 final (by 3–8 to 0–10) and again in the 1977 semi-final thanks to new tactics by manager Kevin Heffernan that hindered Kerry’s tactic to pull defenders forward and take full advantage of the space behind the half back line. The 1977 final saw a 5–12 to 3–6 victory over Armagh in Croke Park. Moran was awarded an All-Star for his performance in the 1976 championship. He was also part of the 1976/77 side that won the National Football League for Dublin with a win over Derry in the final. Moran’s arrival on the Dublin senior side contributed significantly to Dublin’s success in 1976. Originally slotted in as a forward, he became the pivot of an outstanding half-back line, that included Tommy Drumm and Pat O’Neill on the wings. The transformation they brought to the Dublin defence was reflected in the contrast between the scores conceded in 1975 and 1976. In the former year 12 goals and 45 points were conceded, while in the latter the comparable figure was 1 goal and 45 points. Moran’s loss to Dublin’s defence was revealed following his decision to sign for Manchester United as a professional soccer player in January 1978. Still only 21 years of age, his move brought an end to a glittering gaelic football career that yielded two All-Ireland and one National Football League medals. His departure tore the heart out of a Dublin defence and removed a player ‘who had all the attributes in abundance which Kevin Heffernan prized so much.’ Mick Dunne summed up his greatest quality as ‘inflexibility’. After playing with Bohemians, Moran moved to UCD where in December 1975 he won the Collingwood Cup. In February 1976 Moran won the Universities Championship when he scored the winner for the Irish Universities against their Scottish counterparts. Moran was spotted by Billy Behan, a Manchester United scout, who reported to United manager Dave Sexton, and Moran signed for Manchester United in February 1978. He made his senior debut on 20 April 1979 against Southampton, and was a regular player in the first team by the time Ron Atkinson had succeeded Sexton as manager in June 1981. Despite not being the tallest of defenders, Kevin was known for his strong aerial ability and was a threat in the box from corners and set pieces. Playing as a centre back, he won FA Cup medals with the club in 1983 and 1985. Moran is notable for receiving a red card in the 1985 FA Cup Final against Everton, the first player ever to be sent off in an FA Cup final. TV cameras revealed that he had gone for the ball, and not for Peter Reid in the offending tackle. He was later presented with the winner’s medal that had at first been withheld. After 10 years with United, Moran left Old Trafford as a 32-year-old in the summer of 1988, having played his final 18 months at the club under the management of Alex Ferguson. His first team opportunities had been limited since the arrival of Steve Bruce in December 1987. He transferred to Sporting Gijón, where he remained for two seasons, making 33 appearances without scoring. In 1990, he returned to England to join Second Division Blackburn Rovers. He was an automatic choice in the first team, but endured a disappointing first season at Ewood Park as Rovers finished 19th in the Second Division. The following season was a huge success, however, as playoff victory ended the club’s 26-year exile from the top division and secured their place in the new Premier League. Moran continued in his role as club captain as Rovers finished fourth in 1992–93 and runners-up in 1993–94, and finally retired at the end of the 1993–94 season – one year before Rovers won their first league title in 81 years. Moran made his debut for the Republic of Ireland against Sweden in 1980 and played a key role in Ireland’s unsuccessful attempt to qualify for the 1982 FIFA World Cup finals in Spain. 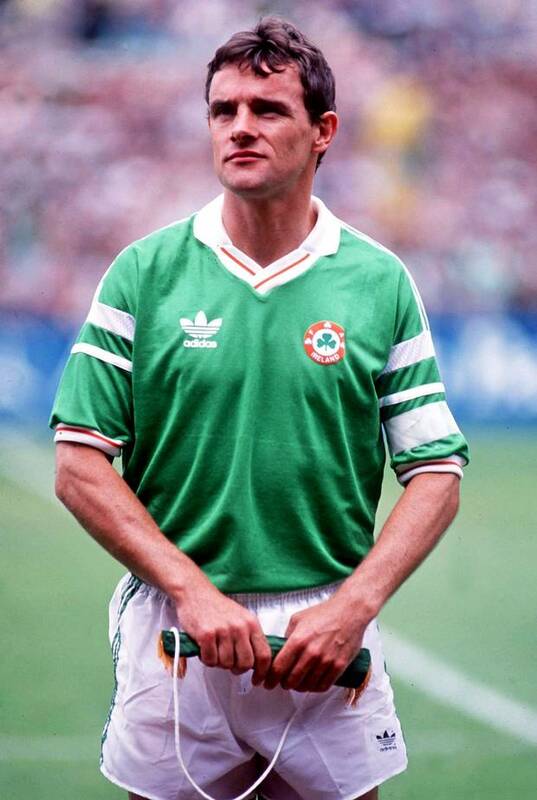 He played 71 times for Ireland between 1980 and 1994, including UEFA Euro 1988 in Germany and the 1990 FIFA World Cup in Italy, and scored 6 goals. He was also a member of the Irish squad at the 1994 FIFA World Cup in the United States, despite being 38 years old and about to retire from playing completely, but did not play due to an injury he picked up before the tournament started.